(NaturalNews) Former South African leader Nelson Mandela was a darling of the progressive Left, which explains why they gave him a pass for engaging in an activity that completely unhinges them when a white American dentist does it. As noted by Andre Walker in a recent column over at Townhall.com, nothing in recent memory has so exercised global "animal rights" activists as much as the recent killing of Cecil the Lion in July by Dr. Walter Palmer of Minnesota. His death, Walker wrote, "is undoubtedly the greatest coup these campaigners have had in years, but does it also show the hypocrisy of the liberal twittocracy?" And while some people can't understand why others would want to spend thousands of dollars hunting animals, there is also a fact to which animal rights groups remain oblivious: There is consensus in a number of countries like Zimbabwe, where Cecil was killed, that hunting – for consumption, for sport, or both – is a vital necessity in terms of conservation. So necessary is hunting to the protection of natural surroundings and the environment that in April 1991, Walker notes, South African newspaper The Weekly Mail "ran a front page article about Nelson Mandela going hunting." 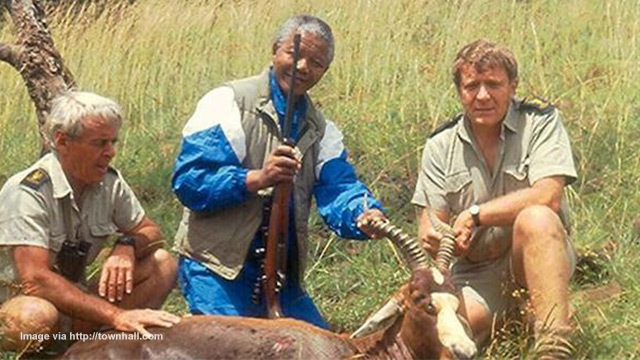 The story, "Mandela Goes Green," featured a photo of Mandela clutching a hunting rifle and posing, smiling, over one of the game animals he shot himself. Mandela "hunting and culling... overpopulated species"
The story came with the byline, "A hunting trip converts the ANC leader to conservation," and it talks about the African National Congress party leader embarking on a "two-week holiday at a Lowveld nature reserve hunting." For clarification purposes, the story went on to note that Mandela hunted with the KaNgwane Parks Board, "renowned for its methods—including hunting and culling of overpopulated species." Mandela was lorded for being "green" on his trip to Lowveld not in spite of hunting but because of his embrace of the sport. The article makes it clear Mandela recognized the need to make the park sustainable by foreign tourists, including hunters. These hunters pay a fortune for what they do (Palmer handed over $55k), and that is the only thing that pays for park rangers and all the conservation work they do. But Mandela was never challenged over this and no matter what his personal thoughts on the matter – he obviously enjoyed the hunts – his motives were never questioned by the unhinged Left. Rather, when he posed with an animal he had personally killed, he was instead hailed as a defender and purveyor of good, green, progressive values. By comparison, however, Palmer has been branded a pariah by the politically correct animal rights crowd – and for doing precisely the same thing as Mandela. "The same people who are calling for the murder of Walter Palmer, [sic] also see Mandela as some sort of man god who could do nothing wrong," wrote Walker. Marginalizing "the legitimate hunting industry"
In case you were wondering if you might have missed the same kind of smear campaign designed to ruin Mandela, you didn't, because there wasn't one. Rather, it is easier for them to attack Palmer while withholding similar criticism for someone they considered like-minded ideologically. Make no mistake, Mandela was not in the wrong to hunt; as stated above, such hunts are vital to the economy of Africa, and they help maintain the proper ecological balance between beasts and the land they use to support them. So if you disagree with what Palmer did, then you ought to be condemning everyone in Africa who hunts – including indigenous citizens – rather than scapegoating a few white Americans. Further, if you condone Mandela's hunts, then you cannot condemn Palmer's. And yet, some are. American, United and Delta Airlines – cowardly succumbing to a few loud progressives – have all announced that they will no longer allow lions, leopards, elephants, rhinos or buffalo that were killed by trophy hunters to be shipped. "This is yet another example of how Cecil the lion is being used to marginalize the legitimate hunting industry," wrote Walker. "Perhaps it will be illegal soon, and the media circus that demanded the ban will do nothing to repay African conservationists for the money they lose."